Product analysis by Vlad Catrinescu – requested by Aquaforest, but thoughts are my own. With over 65 000 customers ,125 million licenses, and 80% of fortune 500 using it, Microsoft SharePoint is one of the most used collaboration and intranet platforms in the world. With that many users, and companies relying on SharePoint, the SharePoint admins behind every company’s farm must make sure the farm is always working properly and the users are happy. However, the surge in SharePoint usage often gives rise to “SharePoint Sprawl” which is a significant challenge for those tasked with management and administration. Furthermore, with the rise of Hybrid SharePoint deployments, where the SharePoint admin now has to manage both the internal, on-premises SharePoint farm, as well as the Office 365 SharePoint Sites. To ease the SharePoint Administrator’s task, and to help him prevent problems before they happen, Aquaforest created a product called Checkpoint. Before we go into the review, here is a description of the product from the company’s website. 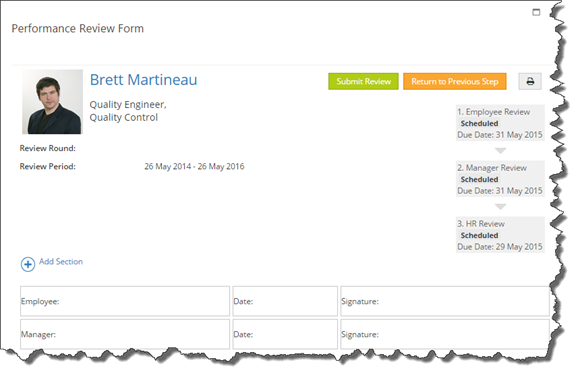 Aquaforest CheckPoint is a SharePoint Governance tool that is designed to monitor and report various details from an organization’s SharePoint farm. It supports both On Premise and Cloud SharePoint installations. 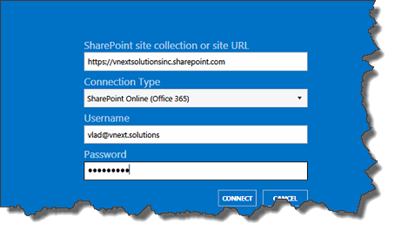 It connects to SharePoint remotely, as a result you do not have to install it on the same machine as your SharePoint server and one installation can serve multiple SharePoint farms. First thing to note is that CheckPoint is a client application, so I was able to install it on my laptop. After installation, I was prompted to enter the first Site Collection I wanted to manage. Each site collection is called a “Connection” and you cannot connect to a Web Application or a Farm. After you create your first connection, and every time in the future when you open the application, you go directly to the dashboard. The dashboard is where you can see all your current connections, reports and alerts. Alerts will need to be configured, so that is why we don’t have any yet! When we go into a connection, we are able to see the Subsites, Lists & libraries, Users, Groups, Permissions and Content Types. When you go on one of the items, such as a list, or a person, you can view all its properties. A bit like SharePoint Manager, but without having to be logged in on the server. Now, let’s take a look in the Reports section. 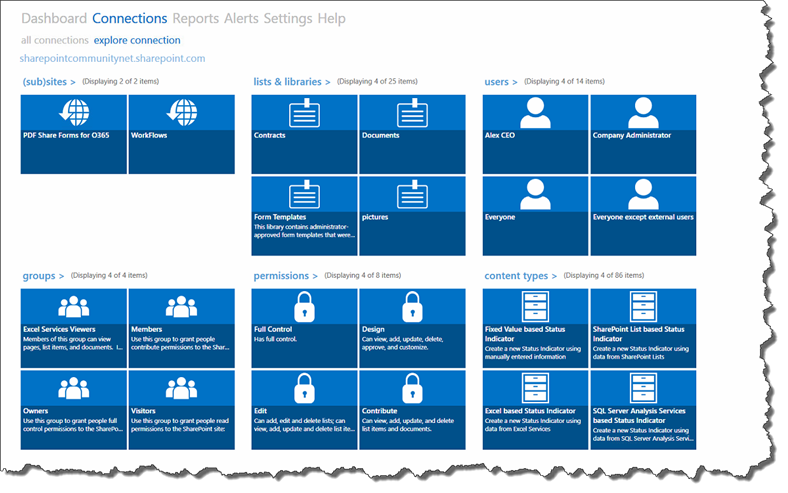 The Reports section in my opinion is the heart of the product and is the section that brings the most value. There are thirteen reports out of the box, however you can add custom ones that fit your business needs. Here are the ones included out of the box. Let’s take a simple one, such the empty site description. 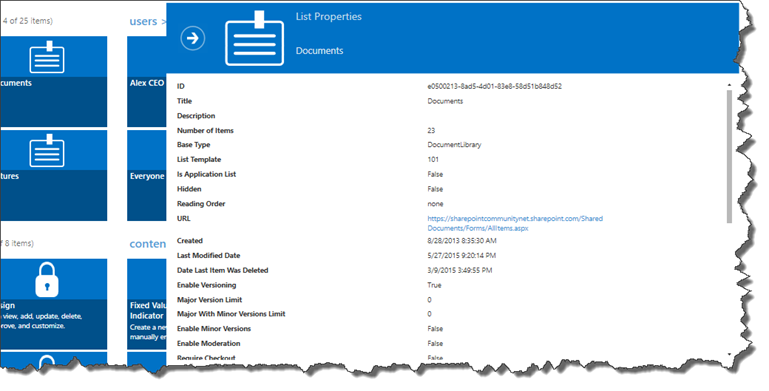 Having a site description for every site, can be a part of the company governance policy and as the SharePoint Admin, you need to find out regularly if new sites don’t have it. When we open it, we first have some information about the report schedule and name. Next Step is to choose the fields you want in the report as well as conditions. By default, this report will give you the Title, URL and Description of all the sites who have no description. In my case, I want to also add the Owner of the site, so I know who to contact incase a site is missing a description. So by using the new column button, I added Owners to the list of buttons I want in the report. In the next step, I will choose the targets where I want to run the report. On this step you basically decide what Site Collection you want to check. After clicking next, the report took less than a second to run and showed me all of the sites without a description as well as their owners. Unfortunately, I only see the name of the owner and not username, so this could become a problem if you have thousands of John Smiths who don’t put in their description. However, Aquaforest has informed me they will make this available in the next update. You can easily export the report to PDF/CSV to follow up on it. If we go to the next tab, we have the option to schedule this report to run every day, or every hour. This will be useful, so we’re alerted when a site gets created without a description, so instead of having a monthly task to check all the company Governance, we can be proactive about it and get it fixed before it becomes an issue. For the sake of this review, I made it run every 2 minutes. 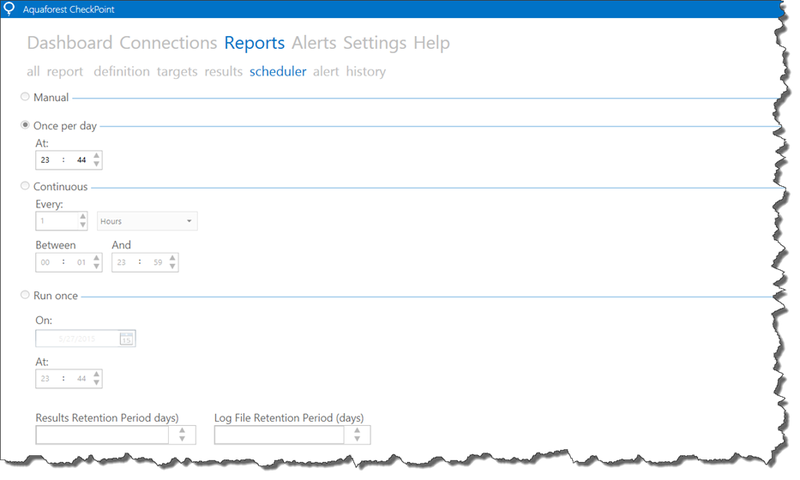 However, for alerts to work, you have to enable them in the next step. Here you have the choice if you want the alert to show on the dashboard, and if you want to receive an email if it fails, and also if you want the report attached or not. Since the site description is an important part of the company governance policy, I decided to activate all and get an email if more than one site doesn’t have it. When you click on the alert, you are able to see the history of the last runs, as well as the results and easily export them to CSV or PDF. As you can see, as soon as one of my users entered their description, the numbers of row went from 4 to 3. If you want to create your own Report, you simply click the new report button in the bottom bar. First thing you will have to choose if it’s report that will run on List/Library, User, Site or Document. In this example, I want to see all the document libraries where a document was not modified in the last 1 year. (Or 10 days for this demoJ). Afterwards, I created my conditions as well as columns that I wanted. And I selected my targets. I added another connection to an Office365 tenant that I manage, so this report will search in both. And, as you can see we found a few old lists that haven’t been used in a while! The report is now in the Report Gallery and ready to be run. Another useful report can for example be, finding if a certain user has any documents checked out to him before he quits the company. I did this report in a few seconds and now I can see if Vlad’s account has any checked out files and tell him to check in his modification before his final days. PDFs that are not fully searchable (PDF files, where the text in them is not actual text, but kind of an image). SharePoint is one of the most, if not the most popular intranet platform in the world, and there is a lot of pressure on the SharePoint Administrators to keep it running, as well as make sure that the sites / site collections and even content respect the company Governance Plan and are in good shape. With the rise of the hybrid SharePoint deployments, SharePoint administrators will have a lot more to take care about and that is why they might need an Administration or reporting tool to help them know what shape their farm is in, and if anything needs to be corrected. The best SharePoint admin is the one that end users don’t have to contact, because he finds the problems before his users do. In this blog post I did a review of the CheckPoint SharePoint Administration Tool by Aquaforest and found it extremely easy to use and pretty powerful. I have reviewed the first version of the software that included 13 reports and a lot of ways to customize your own reports, and found everything included worked out very smoothly and I was able to create reports with many things that could save me a helpdesk call later on. 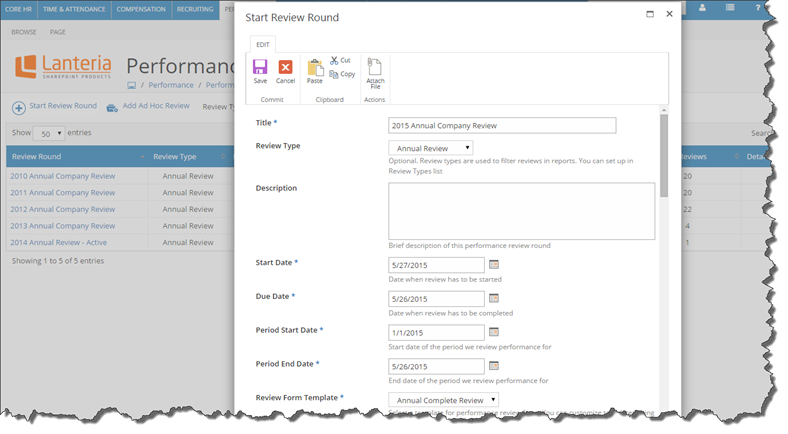 There are some small things that would be nice to have in the reporting, such as user name instead of display name of the user, but overall the tool can be very helpful for today’s SharePoint admin that only has one on-premises farm to manage, as well as tomorrow’s SharePoint Admin who will have to manage both on-premises and Office365 farms. To learn more about CheckPoint, visit their site by clicking on the logo below. Product analysis by Vlad Catrinescu – requested by Lanteria, but thoughts are my own. There is something that all companies out there have, and that is employees. Once a company grows, managing the time & attendance, Compensation, recruiting, learning, succession and all the tasks related to Human Resources can become a challenge, and if not done right, can lead to unhappy employees. In order to organize HR and make all the processes better, companies will often buy a Human Resources Management System (HRMS). A Human Resources Management System refers to the systems and processes at the intersection between human resource management (HRM) and information technology. When considering a new HRMS, companies often look if they should go with a brand new product, whether it’s offered “on-premises” or in SAAS, or as an add-on on something they already have. With over 65 000 customers ,125 million licenses, and 80% of fortune 500 using it, Microsoft SharePoint is one of the most used collaboration and intranet platforms in the world. However, there is no built-in solution for managing human resources, and even creating an onboarding workflow customized to your company requires you to have SharePoint Development experts. That is why a company called Lanteria, created a full HRMS solution that sits on top of SharePoint. Before reviewing it, here is a description of their product from the company website. Lanteria HR is a comprehensive human resource management system that manages the entire lifecycle of your organization’s workforce. When you log in to Lanteria as an HR manager you get a dashboard showing you what your company looks like from an HR point of view. You can see how many absences today, how many employees you have as well as vacant position and some other stats. 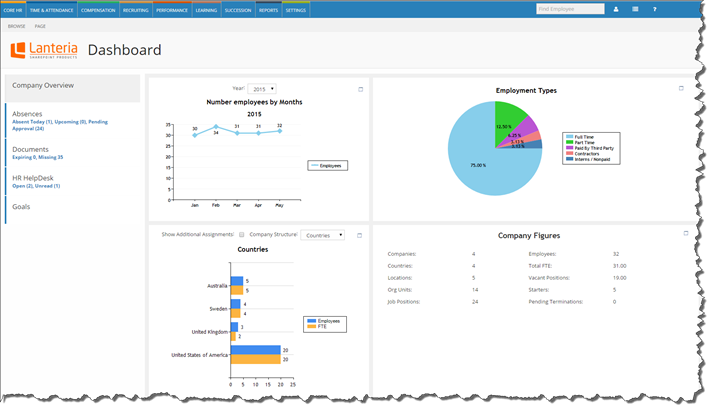 The dashboards are very business friendly, and you can easily go into more details in each one of them. 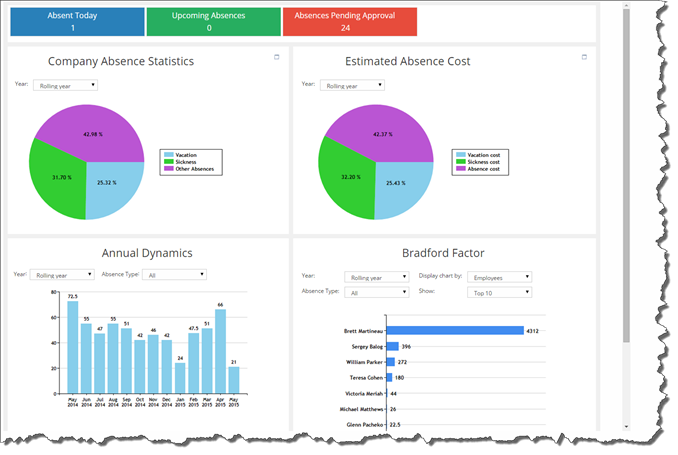 For example, when you go into absences, you have more dashboards such as Absence statistics, dynamics and the Bradford Factor. If you don’t know the Bradford Factor is, don’t worry as I had to Bing it as well. The Bradford Factor is a way to measure absenteeism and you can find more about it here. Those are part of the Time & Attendance module. For most of the dashboards, you can change the parameters directly in the page. 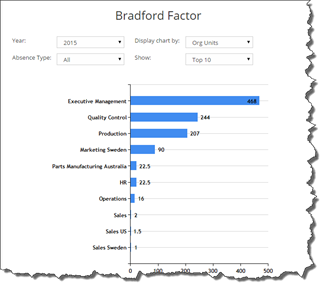 For example, you can easily get the Bradford score of the top 10 Org units in 2015. Now, let’s take a look at the Core HR module part of the product. The Core HR module allow you to manage the company’s structure and define relationships between various departments, teams and employees. The demo environment I was given, already had employees inserted, but it’s really easy to add new ones using a simple, SharePoint form. In the Core HR module, you can view the Organization Chart with or without showing the employees. You can go in any Organizational unit and see the positions, who’s in what role and if you have any vacancies. It is also worth noting that if you ever need to export the data for a meeting, or for your boss, you can easily press the Export button on almost all the dashboards / reports and you have an Excel/PDF/Word copy of what you see on the screen. Job Roles, Categories and everything is stored in SharePoint lists, accessible from the Core HR menu, making it easy for HR professionals to add them without requiring extra training. In the following screenshot you see what the Job Roles list looks like. 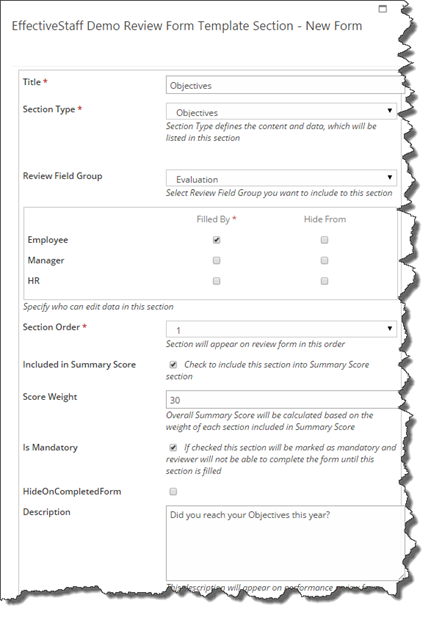 Next big thing in the Core HR module are reports. There are a bunch of reports that come out of the box, and you can always create your own custom ones if you need something more specific to your company. With the reports provided, you have a lot of information where you can easily see the profile of your employees. 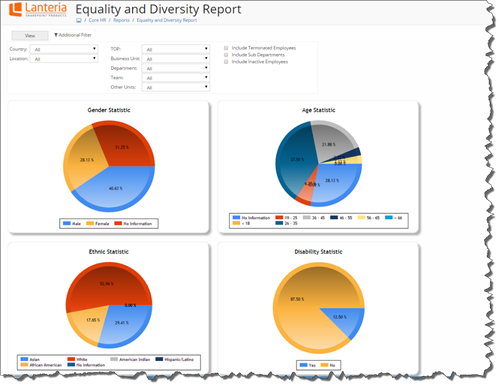 For example, here is the Equality and diversity report. And here is the Termination Statistic report! The last part of Core HR I want to talk about is Employee Documents. With the Employee Documents function, you can set it up so that, for example, all employees of type “Sales Person” need to give you a copy of their Driver License. 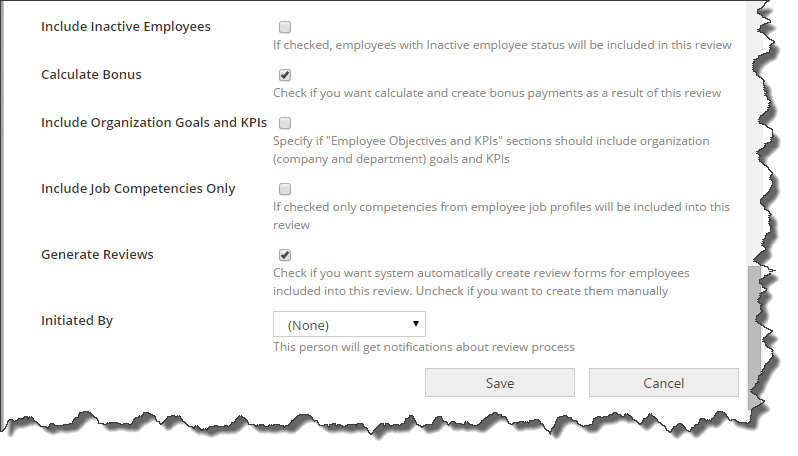 You set those up in the Settings part of the Core HR Module. Afterwards, in the Documents tab, you can easily see all the Documents related to the business Human Resource practice, and easily see who didn’t send you all their documents yet. That is about it the Core HR module, now I will switch over to the Performance module. The Performance module is a performance appraisal system that automates the employees’ performance management, assessment, and appraisal processes. As all Human Resource professionals know, doing a performance review of your employees, specifically aligned on their goals and job description is very import and must be done at least once per year! What I really loved about the Review Form designer is that you create only one template, for the whole company, however the contents of the form and what employees are evaluated on change for each employee, since they have their objectives assigned in their profile. That means, you do not need to create 100 different review forms every year. When you add a new section, you can select who has to fill it, as well as who should see it. For example, you might want to add a “Manager Rating” section, that you don’t want the manager to see, but you want HR to be able to see it. In my example, I simply added a where the employee can say if he completed his objectives this year. Afterwards, you can set workflows such as Employee > Manager > HR so the performance review goes through all the require roles for it to be complete. This module also has a lot of reporting built in, and you can run some quick reports, to see how employees are doing on their KPI’s for example. The next module I am going to talk about is learning. Learning, is a big part of employee development and every company needs an internal Learning Management System (LMS) to provide training to employees as well as keep track of who finished what for both evaluation, as well as legal reasons in some countries / provinces. 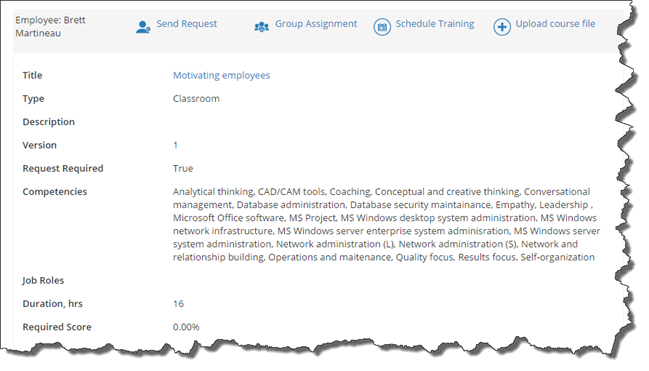 Once you go in the learning catalog, you can view available learning grouped by either Category, Job Role or Competency. For every class, you can set it up to either require approval by your manager or not. For example, for the class below, employees would need an approval before being able to add this course to their training. However, a training can only be a document for which you don’t need any approvals, so you can add it to your plan. Once you add it, you have it in your personal development plan where you can launch it. You can view all the pending training requests in a cool Dashboard and approve them directly from that view. As with every other module, you have quite a few reports built in! One of the reports I found useful, and I am sure a lot of business wish they had this on hand in a few second is the External training report. Managing employees can be one of the biggest tasks of a company, since they represent it and if they aren’t happy, clients will know it. By implementing an HRMS, the Human Resources department has a better view of the current situation in the company, as well as being able to better help employees with their questions, or evolution of their position in the company. 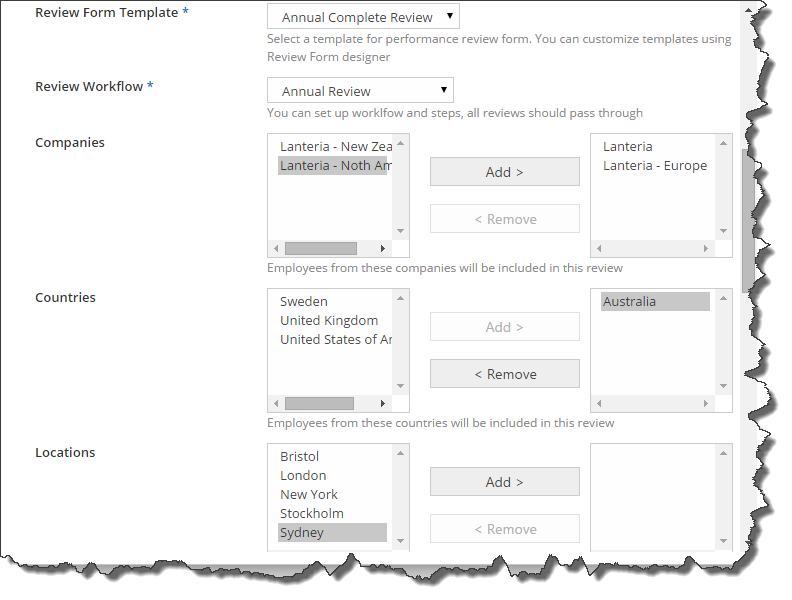 In this blog post, I have reviewed Lanteria HR, a Human Resources Management System built on SharePoint. The product is honestly huge, in the sense that it has a lot of features, and if I tried to talk about each of them in this blog post, it would have been called an eBook. In this review, I talked mostly about the Core HR, Performance and Learning modules, as well as talked a bit about the time and attendance module. Having taken a few Human Resource classes in University, I could clearly see the problems that every feature of the HRMS was trying to solve, and the software was very easy to use. The thing I probably loved the most, is all the Business Intelligence behind the HRMS, and the ability to export a report that gives the overall view of the company, as well as specific data in a few seconds. The one thing that I guess most companies will find hard, and this is true for any HRMS you are going to buy, is entering the initial data and configuring all the description, competencies, organization chart, etc. However, once this is done, you have a very powerful system that will be easy to use and to update. If you are a Human Resource professional looking for an HRMS and you have SharePoint in your company, I highly suggest you asking them for a demo, and exploring the modules I didn’t cover in this review, as they can add a lot of value to the Human Resource Department. To learn more about Lanteria HR, visit their site by clicking the logo below.